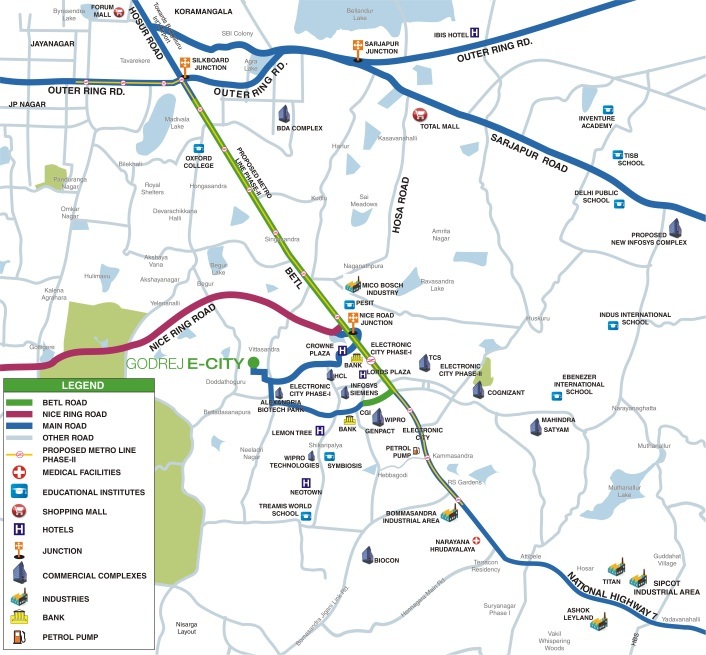 Godrej E-City Phase 3 Location Mapsuggests that the project’s location is quite premium. The development enjoys proximity to a number of essential features and civic utilities. The National Highway -7, Nice Ring Road and the Betl Road are close by. The proposed metro line (Phase 2) is nearby. Offices of IT giants like Wipro, TCS, Satyam, Mahindra, Infosys and Seimens are close by. Banks, hotels, schools, medical centers, industrial areas, banks, markets, and malls dot the neighbourhood. Some of these names include Treams World School, Indus International School, Ebenezer International School, Narayana Hrudalaya, Symbiosis, Lemon Tree Hotel. Thus, this is a premium address to enjoy the high-life.